I have a serious shortage of cute tops in my wardrobe. Lots of my dressier tops are made of hard to wash fabrics, which doesn't really work for my life right now with an 8-month-old baby. Cotton is pretty much the way I roll these days... I used a cotton voile for the Taffy Blouse from the Colette Handbook. The blouse is cut on the bias, so no closures needed, which is nice. 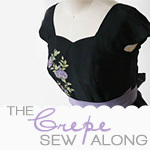 It also has french seams, which is good for a thin fabric like this. Although I think next time I make it, I'll probably just use my serger to save time. I'm an impatient lady. The Handbook also shows you how to make your own bias binding, and I did try it but I think this fabric was too flimsy. So I ended up just going with some store-bought navy binding. I will try the technique again for a different project and use a bit of a heavier cotton. I'm running away from a wasp in this photo - ha! Instead of using bias binding on the sleeves, I tried the shell-tuck stitch feature on my machine. It looks sort of cool, but I think the visible thread makes it look a bit messy... Sorry no photos of that, I forgot! I managed to finish it in time to wear to the Colette Patterns Fall 2012 Launch Party at Spool of Thread in Vancouver. It was cool to meet up with Sarai and Kenn again, plus meet the store owners and chat with other fellow sewing enthusiasts. Not to mention the yummy cupcakes available for noshing - yum!!! I didn't make a muslin for this project, which I probably should have... The armholes are a bit high for me, making it snug around the armpits. I'm not sure how to alter the armholes so that the sleeves still fit, and now I'm kicking myself for not thinking to ask Sarai Mitnick (aka Ms Colette Patterns herself) on how to do it... Talk about a missed opportunity to learn from a master! Blarg! I'm thinking of taking off the sleeves, widening the armholes and finish them with bias binding for a sleeveless blouse. Then I'll "recycle" the sleeves and make another Taffy. But we'll see... I will probably just wear it as-is. I was wearing my Taffy while driving with the windows down the other day and the sleeves kept hitting me in the face, hahaha. Talk about a hazard! LOL! That is a lovely top. I never tried any of the Colette patterns but I've heard great things about them. I'll have to try them.